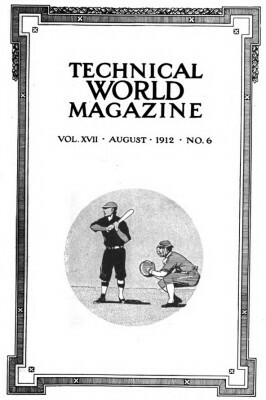 Technical World Magazine : Board Riding the Surf, 1911. THE native Hawaiians are the world's champion swimmers and divers. Surfboard riding is one of their favorite amusements. 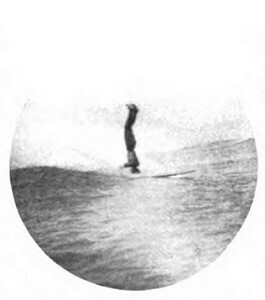 The practice is to so direct the bit of flat, unstable plank as to recede with the waves as they run seaward in a great level flood after breaking their strength upon the sandy beach. The illustration shows one of the most extra-ordinary feats of an agile and unusually skillful swimmer. But the sight of a man standing on his head and maintaining his equilibrium is one that aroused the photographer's admiration. Fortunately he was able to catch a snapshot of this remarkable piece of clever water craftsmanship. Geoff Cater (2017) : Technical World : Board Riding the Surf, 1911.